What to make and the criteria used to decide it’s good? Project management does not help you answer these crucial questions. Innovation projects are notorious for having huge rates of failure. The root cause of the failure is skipping answering one or more of the crucial questions. Without first knowing the answers to these questions you’ll waste huge amounts of time and money on trial & error. Predictive Innovation solves that problem. 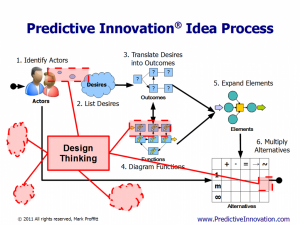 Predictive Innovation is a structured system for thinking. It’s based on the same science that allows digital computers to process information and is supported by over 25 years of research demonstrating its effectiveness. It breaks down any subject into the essential parts so you can quickly understand and see potential opportunities. Innovation doesn’t occur until the customer is using the product or service. Most companies consider the innovation process complete when they launch the product. That thinking stems from the belief that making something new is all that’s needed for innovation. The truth is that new doesn’t mean better or desirable. Even if a new product is absolutely amazing it doesn’t innovate unless customers know it satisfies their desire and are willing to pay to get it. 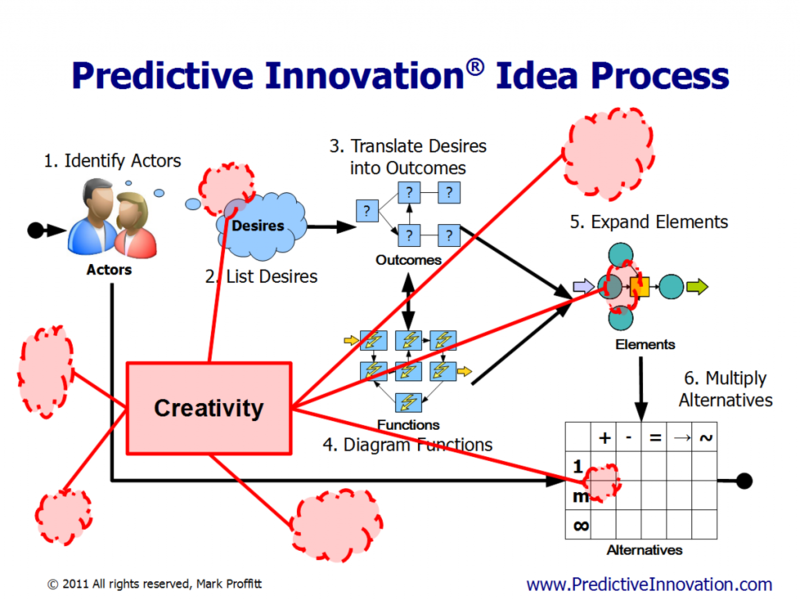 Combining Predictive Innovation and Agile / Scrum is a powerful formula for success. 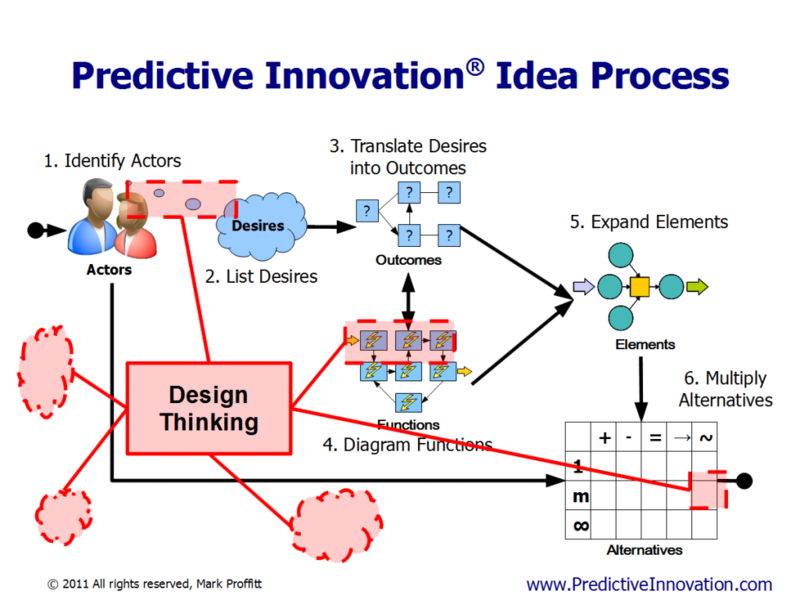 Predictive Innovation proactively determines future requirements and Agile/Scrum helps to efficiently get solutions to market. 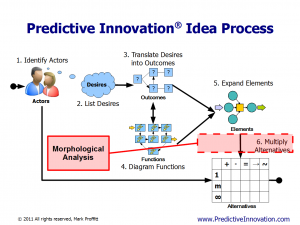 Predictive Innovation also can show all the ways to make something so you know in advance if it’s possible and you can choose the most profitable approach. Staged Gate is a project management system. It doesn’t have a thinking system. It’s poor for new products because it’s based on trying a lot of different ideas and weeding out the failures. That’s deadly to a start-up that doesn’t have the deep pockets to keep funding trial and error. Staged Gate is notorious for high failure rates. However, Predictive Innovation principles have been demonstrated to increase the profitability of Staged Gate by 95 times with 96% success rates at launch. 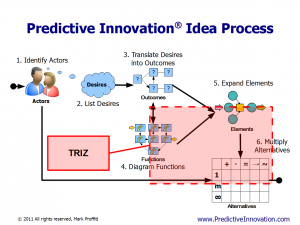 TRIZ is a great thinking system for very specific types of “how to” problems. 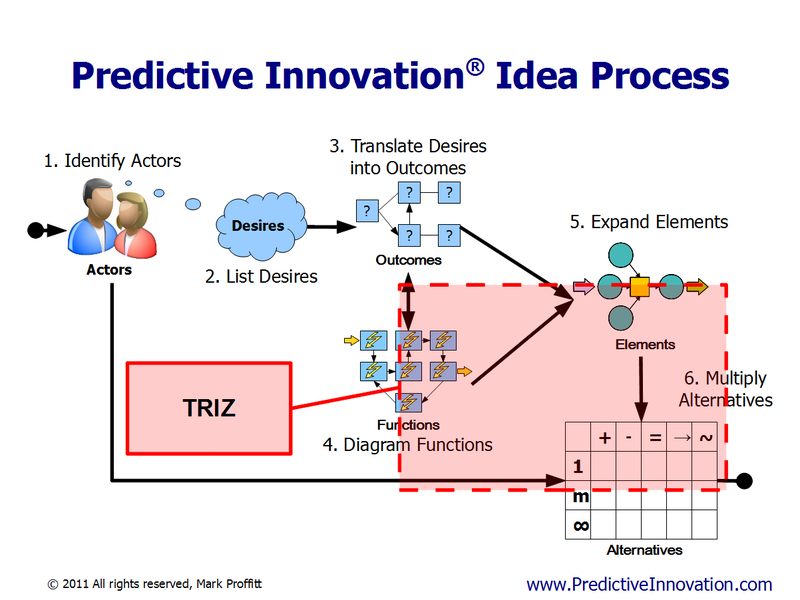 The name TRIZ is a Russian acronym meaning Theory of Inventive Problem Solving. TRIZ is great for its intended purpose but it’s too focused on problem solving and physical systems to be broadly useful for innovation. Morphological Analysis (MA) is a thinking system developed by the famous astrophysicist Dr. Fritz Zwicky. Morphological Analysis uses tables to identify combinations. Dr. Zwicky used MA to predict many discoveries including supernovae and neutron stars. The biggest problem with MA is it doesn’t have a clear way to specify what should be in the tables. Dr. Zwicky was a genius and MA tends to require similar expertise to set up the tables properly. Without clear rules for setting up the tables it misses valuable parts of the idea space. It can easily generate an overwhelming number of ideas yet completely miss entire categories of extremely important ideas. Blue Ocean Strategy is a combination of a goal, some tools, and a few guidelines for implementing a plan. It has a few aspects of a thinking system but isn’t complete. Plus, it makes several assumptions that are frequently incorrect. 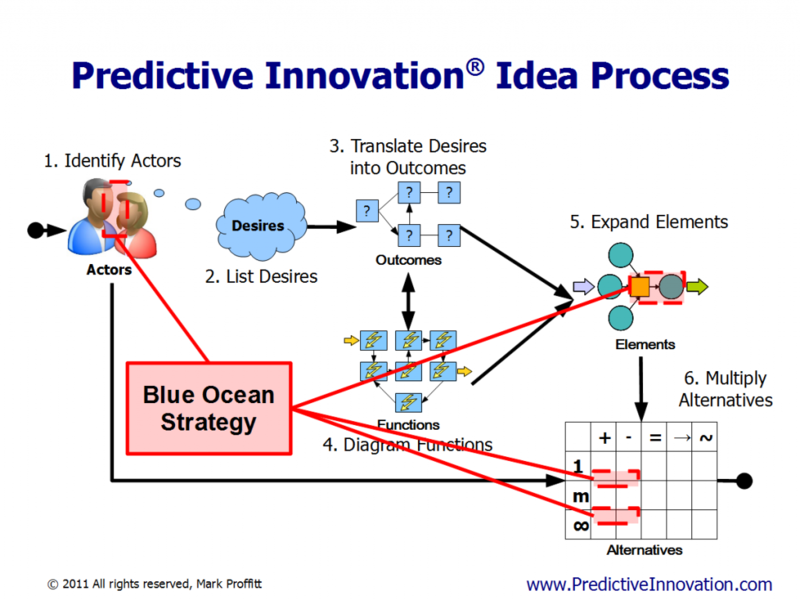 Blue Ocean offers a few tools that are parts of a thinking system. The tools offered only work for a few special cases. Unfortunately it doesn’t have a way for you to know if it will work or not. One of the tools is what they call the 4-Actions. These mirror a portion of Predictive Innovation’s 7 Elements and 15 Alternatives. Predictive Innovation shows there are a minimum of 15 Alternatives for each of the 7 Elements of each Outcome. Actions are only one of the 7 Elements. Blue Ocean doesn’t cover the other Elements. That means Blue Ocean’s tool is only 3.8% of a complete system. It’s likely to send you crashing into the rocks to sink to the bottom. Creativity is the most common system for finding ideas. It’s also the least successful. There are countless creativity based approaches to idea generation. Some of the creativity approaches are: Brainstorming, DeBono’s Six Hats, Killer Questions, Lateral Thinking, the list is practically endless. All of those are supposed to be thinking systems but in effect are the opposite of thinking. Creativity is a random approach. Because it’s random it focuses on increasing the quantity of ideas ignoring quality. It specifically avoids criteria for evaluating ideas so it wastes a lot of time on wacky irrelevant ideas that don’t lead to successful products. Without real customer centered criteria for evaluating ideas, creativity is prone to personalities driving decisions. With a less than 1% success rate, Creativity is worse than doing nothing at all. Design Thinking is an incomplete system. It’s just a set of goals without a way to actually do it. The main goal is an attempt to consider how a product fits with other parts of the environment. Most people who claim to use Design Thinking are just using creativity with an iterative version of Staged Gate project management. The lack of a real thinking system makes Design Thinking very person specific and dependent on inherent talent. That makes it unrepeatable and difficult to scale. JTBD/ODI has been shown to be up to 9 times better than creativity based systems. It’s great for “what to make” ideas but not “how to” make it solutions. 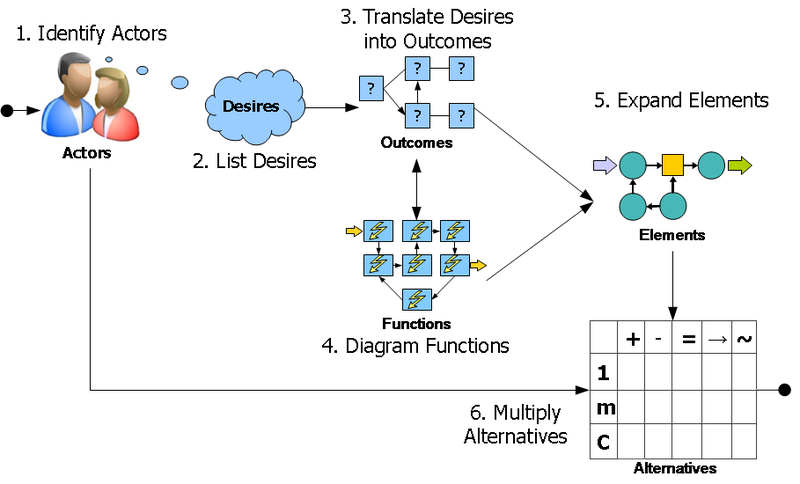 Another weakness of JTBD/ODI is it relies on existing demand so the predictive value is decreased causing projects to start late relative to the market opportunity. It only covers about 13% of the “what to make” ideas space. 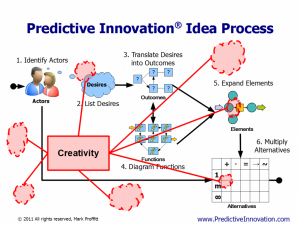 Predictive Innovation covers the entire idea space. 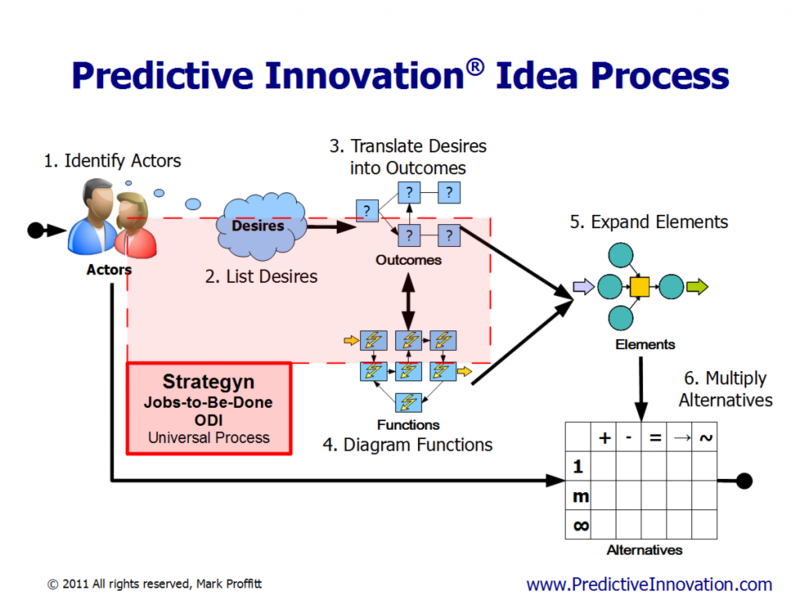 If you know JTBD or ODI you can easily learn Predictive Innovation and multiply your profits by another 8-9 times. Big Data is poor at predicting because it doesn’t understand the root causes. Computers are fast but can’t actually think. Ironically, it misses huge areas of information. Since Big Data is analyzing past records it only sees what you already chose to measure and record. The expression, hindsight is 20/20, accurately describes Big Data. That makes Big Data highly prone to unexpected “Black Swan” catastrophes. It’s like racing down the road while looking in the rear view mirror for guidance.